YOUR LIGHT CLOAK OF MANY COLORS AWAITS YOU! Beloved masters, as the Age of Pisces fully fades into the past, there is a new system of rules and Universal laws which will now apply to all emerging Spiritual/Human Beings. A new, expanded cycle of Creation is in progress, and all of you who are striving to attain a unified state of consciousness will be designated as advanced cocreators of the future. As an empowered Bearer of God Light on the physical plane of existence, your new Divine Mission is to assist in the expansion of God-consciousness. Your goal is to become a master of manifestation, drawing forth the Essence of Creation, and activating it within your Sacred Heart. Then, through a heightened intuitive awareness, you will begin to receive specific thoughts / concepts, which will be sent forth into your Sacred Mind. You will gradually gain the ability to radiate new Seed Thoughts into your personal Flower of Life/Creator Wheel, which will begin the advanced process of creating those things that you require for an abundant, joyful, refined existence. Your Light resonance will increase as it gradually flows forth in a sweeping Infinity pattern, making a greater, more beneficial impact on your environment and those around you. Those of you who are actively seeking Self-mastery are being prepared to tap into the new Divine Blueprint of the Aquarian Age, which is now radiating forth through the great Archangelic and Devic Kingdoms. As you clear your personal environment of the negative, imbalanced frequencies of the Third/Fourth Dimensions, you are gradually moving through the remaining sub-planes of the Fourth Dimension. This is the basis of the ascension process humanity is now experiencing. You can deny and ignore this fact; however, sooner or later, every Soul on the Earth-plane will have to traverse the path of ascension into a higher awareness. Why not take advantage of the grand opportunity that is being offered to you now? The longer you wait, the more difficult the journey will be. Spiritual fire is the basis of all manifestation and forms the background for human evolution. Meditation is a most efficient means of connecting with the more refined facets of your Higher Selves. Making Soul contact is the beginning of the Self-awakening process. The second step is gradually merging with higher and higher frequency facets of your OverSoul / Higher Self, until finally, all remaining fragments have been reintegrated within the physical vessel. The Soul-infused Personality will then begin to display its Soul-power and Soul-purpose, with a primary focus of service, and gradually over time, the development of a Group consciousness. Know this, my steadfast Ones: you are in the final stages of a specific unit of time, whereby you all have been subject to a unique system of rules. Total free will was deemed to be a great gift; however, it became a great burden as humanity sank into the broad spectrum of duality, which has resulted in great pain and suffering. There was also a non-interference clause written in the rules, and the specified time for this particular phase of Creation had to be played out before our Father/Mother God could declare: â€œIt is enough. It is time to intercede. There will be a Divine Dispensation for those who are striving to attain Self-mastery, and the many spiritual Cosmic Councils and the Angelic Kingdom are authorized to give assistance in whatever way is appropriate within the framework of Cosmic Law.â€ The Law of Grace exists within the higher frequencies of Karmic Law, and it will, henceforth, apply to the emerging group of World Servers, as well as the aspirants and disciples on the path of ascension. You, the wayshowers, are the hope of the future. You are laying the foundation for a new social order. It is vitally important that you endeavor to walk the middle path. A Self-master does not take sides, neither for nor against the conflicts that are presently raging around the world. Your personal power is most effective when you stay centered within your Sacred Heart, and you are guided by the wisdom of your Sacred Mind. Your stance should always be that of good will, and your platform should be for the greatest good of all. One of the most important changes within the physical structure of the precious Souls who have incarnated on Earth over the last thirty or so years is that all three God Rays have been activated within the Diamond Core God Cell, and the Soul/personality will have an equal opportunity to develop all of the Divine qualities, virtues and talents of our Father/Mother God. No longer will only one major God Ray, deep within the Diamond Core God Cell of each person, function as the primary Light Overlay of Creator qualities for all of the Soulâ€™s incarnations–with the other two God Rays relegated to a secondary role within the complicated physical anatomy. This is an evolutionary enhancement needed for the next round of the ascension of humanity, and it is a requirement within the Fifth-Dimensional environment. It will be up to the ego/personality, and later, to the Soul-infused personality, as to which of the virtues, qualities and talents of Creation will be enhanced and developed. The goal for the coming era is to embody, activate and learn to efficiently make use of all the Twelve Rays of galactic consciousness. FIRST GOD RAY OF DIVINE WILL, POWER AND THE DESIRE TO CREATE: This is the mental Ray of the Divine Father. It is an out-focused, dynamic Ray, from which the Divine Father sends forth the White Fire Seed Atoms of new Creation. It activates vitality, initiative and the desire to create anew in the realms of physicality. It brings forth the power to create balance and harmony by aligning with your Divine Mission and the Will of our Father/Mother God. The special virtues of the First Ray are strength, courage, steadfastness and truthfulness. By learning to properly use the powerful qualities and attributes of the First Ray, you gain the potential to become true cocreators of beauty, abundance, joy and peaceful coexistence on Earth. Lady Archangel Faith and I, Archangel Michael, are the bearers of the qualities and virtues of this dynamic God Ray. SECOND GOD RAY OF ILLUMINATION, WISDOM, AND THE LAWS OF CAUSE AND EFFECT, ALSO KNOWN AS KARMA: Archangel Jophiel and Lady Constance are the bearers of the virtues, attributes and qualities of this God Ray. This is the Ray that resonates with the LOVE/WISDOM OF THE DIVINE MOTHER, who nurtures within her cosmic womb the Seed Atoms sent forth from the mind of the Divine Father. She supplies the loving energy to ignite the Seed Atoms of new creation, in order to manifest the Divine Blueprint on the material planes of existence. The main focus of this Ray is to turn knowledge into wisdom, and to temper that wisdom with love and compassion. THIRD GOD RAY OF INTELLIGENCE IN ACTION: It radiates the power that assists humanity in perfecting and refining their emotional bodies, and instills a desire to perfect their cocreative skills on the physical plane of existence. It also carries the qualities of tolerance, forbearance, unity and culture. The beloved Archangel Kamiel (or Camael as he is sometimes called) carries the vibrational patterns, qualities and virtues of the Third God Ray. Archangel Lady Charity bears the feminine attributes of the Third Ray. It is the Ray of the Suns (the sons and daughters of our Father/Mother God), the Ray of active intelligence, whereby the dynamic energy of our Father God is melded with the Second Ray vibrations of our Divine Mother, and within the cosmic womb of creation, the grand designs of new creation are incubated, and then sent forward wrapped in her love and wisdom to be manifested within the material realms of this Sub-Universe. When you achieve a certain level of harmony within, you open the physical body gateways or portals to the higher dimensions: the Ascension Chakra or Medulla Oblongata at the base of the skull; the back portal of your Sacred Heart; your Sacred Mind, which is located in the upper, back portion of the brain; and the expansion of the opening of the Crown Chakra. These are major physical steps in the ascension process, for they reinstate your connection with the River of Life, which contains the Living Light Particles of Creation called Adamantine Particles. At that point, you begin to build a force field of full-spectrum Light, as you strive to become a master of Self, and a conscious cocreator who only creates those things which are for the greatest benefit of all. From that time forward, your breathing exercises and affirmations take on a whole new meaning. In order to become a living tributary for the River of Life, you must prepare yourselves to allow the Essence of Life to flow into and through you. You must use what you need, and then allow the remainder to flow forth, ready and available to be molded into wondrous new creations. In this way, you will become bearers and servers of the Light. This is the ultimate message of all the teachings we have given you over these past years. This is the goal of Self-mastery. This is the way of ascension. As you become more proficient as cocreators on the earthly plane, you must constantly monitor your energy patterns and seek to upgrade them. You must liberate the power of the Sacred Fire within, which has lain dormant for many thousands of years. You must learn to direct and focus your energy into the areas of your life you wish to change. By establishing and constantly upgrading your Twelve Ray, Creator Wheel of Life, you are planting the seeds of focused change, and you are supplying the Sacred Fire of Creation needed to manifest what you have envisioned. When you can do this proficiently, your personal world will become a wonderland, and you will become a beacon of Light for all to see. The Universe–and especially the Sub-Universe in which we exist–are in the midst of a monumental transformational process. Planets are shifting places and moving closer to the sun of the solar system of which they are a part; galaxies and Sub-Universes are expanding and moving upward, outward or downward depending on the viewpoint of the observer. New galaxies are in the formation stages s as the impetus for expansion is ignited by a great infusion of Creator Particles of Light/Life, and the seed thoughts for new Creation are permeating the consciousness of all sentient Beings. Never before have you had such an opportunity to serve humanity and the Creator. You are at a crossroads in your evolutionary process, for the world as you have known it is slowly fading away. As Divine Sparks of the Creator, you were given a great gift, a treasure chest of Creator Essence to use in any way you desired. You began this lifetime with a portion of Adamantine Particles of Light stored within your Sacred Heart and a reserve tucked away within your Root Chakra, the Sacred Fire Seed Atoms sometimes called Kundalini and portrayed as a coiled serpent. You have always had access to the Sacred Fire stored within your Sacred Heart; however, you have to remember how to use your Keys to the Kingdom in order to ignite and effectively use this power source of Divine Light. The Kundalini or Serpent Fire is a different matter, for you must clear 51% of the distorted energy you have created in the past in order to tap into this reservoir of Creator Light. If you can view all that is presently in your life as transitory except the Love/Light and Spiritual Fire within your Sacred Heart and Soul, then you will know what we are trying to convey to you. Release your fear of the past and future, eliminate the emotional and mental controls others have over you, and become the free Spirit you were meant to be. The World Pyramid is a Mid-way Station for your multiple Soul Selves. Your good deeds are stored within the Treasury of Light Storehouse within the World Pyramid. There is a harvesting of good deeds every year, and your loving thoughts and deeds are magnified and stored there. The greater portion is melded with Creator Light to be used to create the greatest good for all humanity. You will receive your special gifts and Divine dispensations in accordance to that which you have contributed to the Storehouse of Light. MANY OF THE MAGNIFICENT BEINGS OF LIGHT FROM THROUGHOUT THIS SUB-UNIVERSE ARE HERE TO ASSIST US DURING THESE TIMES OF EVOLUTIONARY CHANGE. ISNâ€™T IT TIME TO CALL ON THEM AND TO ALLOW THEM TO ASSIST US ON OUR JOURNEY BACK INTO THE REALMS OF A HIGHER-DIMENSIONAL EXISTENCE? Beloved masters, as the Age of Pisces fully fades into the past, there is a new system of rules and Universal laws which will now apply to all emerging Spiritual/Human Beings. A new, expanded cycle of Creation is in progress, and all of you who are striving to attain a unified state consciousness will be designated as advance cocreators of the future. As an empowered Bearer of God Light on the physical plane of existence, your new Divine Mission is to assist in the expansion of God-consciousness. Your goal is to become a master of manifestation, drawing forth the Essence of Creation, and activating it within your Sacred Heart. Then, through a heightened intuitive awareness, you will begin to receive specific thoughts / concepts, which will be sent forth into your Sacred Mind. As you clear your personal environment of the negative, imbalance frequencies of the third/fourth dimensions, you are gradually moving through the remaining sub-planes of the fourth dimension. This is the basis of the ascension process humanity is now experiencing. You can deny and ignore this fact; however, sooner or later, every Soul on the Earth-plane will have to traverse the path of ascension into a higher awareness. Why not take advantage of the grand opportunity that is being offered to you now—the longer you wait, the more difficult the journey will be? The Angelic Kingdom and the important services they provide for humanity. The three GOD RAYS for our solar system and the â€œupgrade in consciousnessâ€ humanity will experience during the great transformation process now in progress. The importance of the FIRST RAY OF DIVINE WILL AND POWER during these critical times of change. The DEVIC ANGELIC KINGDOM and the vital role they play for the Earth and humanity. THE GOOD NEWS: IT IS POSSIBLE TO ASCEND INTO A FIFTH-DIMENSIONAL STATE OF CONSCIOUSNESS, DURING THIS LIFETIME, WHILE IN YOUR PHYSICAL VESSEL. "I want to let you know that the webinar was AWESOME! I canâ€™t believe the energy and the connection and the Love I have been feeling during the whole time spent in your presence! The topics and the meditation seem to be what I needed at this time! And even if I thought I knew some other topics, there was another layer of understanding and a deeper meaning that surfaced and I was able to grasp it now! Wow! 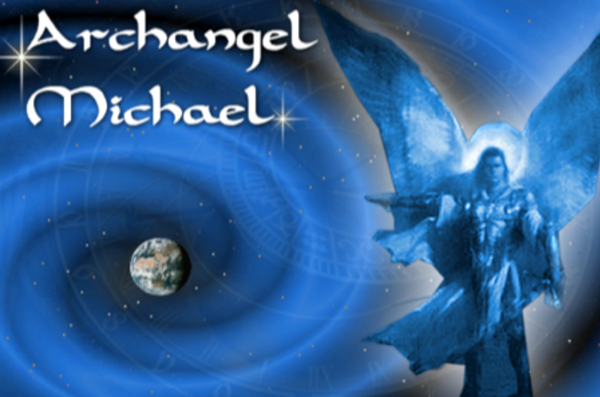 And the final message of Michael the Archangel was so unexpected and unbelievable amazing! I know now that I have found my Soul family …and it feels like Home! I was in tears, though it was joyful and peaceful! Finally! The high vibration and the loving feeling of the webinar stayed with me all afternoon and I can feel it again while I am writing this e-mail!" It's not too late to join us. All webinars are recorded. Grand Final of all the summit channelers on one stage! 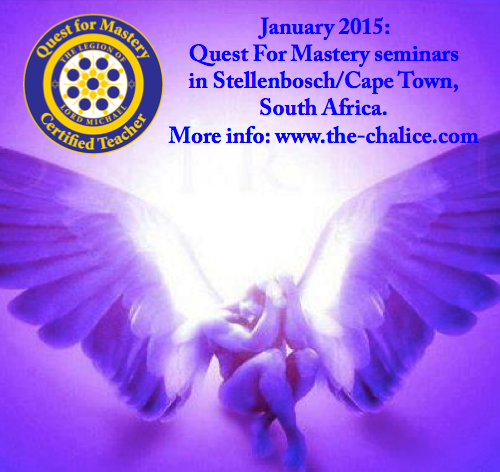 One of our QFM teachers, Fabienne, will be visiting the Stellenbosch/Cape Town area in South Africa in the first half of January 2015. She would love to use that opportunity to teach some Quest For Mastery classes. Fabienne would welcome any tips on where or how to best advertise the workshops, such as well-known spiritual or angel websites/forums. If you have any tips, please let Fabienne know via the contact form on her website www.the-chalice.com. THE MESSAGES IN THIS BOOK WILL ANSWER THOSE QUESTIONS AND MANY MORE TO ASSIST YOU TO CLAIM SELF-MASTER Y AND TO CREATE A WORLD OF PEACE, JOY AND ABUNDANCE. REFERENCE & REVELATIONS * GLOSSARY & ILLUSTRATIONS * 8 Â½ X 11 SPIRAL-BOUND BOOK * $20. Plus S&H ** COMPANION WORKBOOK FOR ARCHANGEL MICHAEL'S MESSAGES. This booklet contains in-depth descriptions of the most important words and terms that Lord Michael has used in his messages over the past twenty-two years. It contains excerpts of the latest and most essential concepts, techniques, meditations and affirmations from Archangel Michael's wisdom teachings, plus eighteen pages of illustrations (some in color). It is a valuable tool for those who are seeking en-Lighten-ment, and also for those who have a desire to share and teach the tools of ascension and the secrets of Self-mastery. THE ABOVE ITEMS OR ANY OF OUR PRODUCTS FROM OUR SECURE WEBSITE: www.RonnaStar.com. OR CALL CINDY AT: 775-856-3654 * (Cindy will adjust the price to reflect the sales price when she processes your order).